Every day, millions of Americans rely on school buses to transport their children. Sadly, some parent’s worst nightmare came true this week as five school buses smashed into each other in New Jersey. 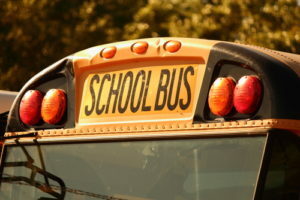 ABC 6 Action News reports that several school buses carrying summer day camp students made impact with one another while transporting the children home. Police are working to determine what occurred to set off the car crash, but they have confirmed that the resulting domino effect damaged at least four of the buses. The vehicles needed to be towed from the scene, and emergency medical staff were called to the accident site to evaluate dozens of children. Most of the children and adults, about 77 individuals, were cleared to return home, but 24 passengers including 21 children and three adults were instead taken to nearby hospitals with personal injuries. Police confirmed that no one suffered life-threatening injuries, and the hospitals have labeled all 24 passengers in good condition. Police will continue to look into this incident to determine what happened. Contact the Bus Accident Attorneys at Drazin and Warshaw P.C. Injuries caused by bus accidents can be serious, and some conditions related to car accidents may take time to fully manifest. It’s important to seek out medical care after an accident, but many victims worry about how they will pay for medical bills. It’s crucial that victims seek out an experienced accident attorney that can help them determine their legal options for pursuing compensation for any and all losses they suffered in their accident. The attorneys at Drazin and Warshaw have a winning track record fighting for justice for injured victims across the State of NJ. We have the know how and experience you need, and we are always there to fight for you and your family to ensure you are treated fairly. Contact our law firm online now to learn more about what we can do for you.